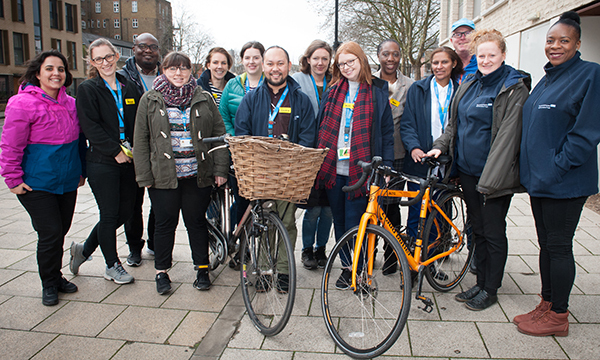 Members of the Lambeth team using the Dutch approach to community nursing. 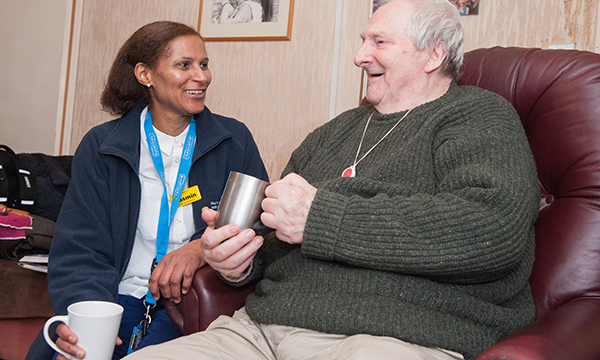 Many nurses would love to have the chance to spend more time with patients, make them a cup of tea and really unpick their complex health problems. In one area of London nurses are doing just that, with the introduction of a Dutch approach to community nursing. A pilot of the Buurtzorg model by Guy’s and St Thomas’ NHS Foundation Trust, which ran from November 2016 to June last year, looked at the feasibility of using elements of the approach in the NHS. Under the model developed by Buurtzorg Nederland, a nurse-led organisation set up in 2006, teams of self-managing community nurses are supported by a coach rather than a manager to provide patient-centred holistic care. There are currently two such teams of nurses in London, in Lambeth and Southwark. One of their aims is to provide greater continuity of care. The nurses carry out personal care and prepare meals and snacks. The care provided ranges from giving medicines and dressing wounds to assisting with washing, dressing and shopping. It generally starts with intense support which reduces over time as patients become more independent. For example, a patient struggling to manage their diabetes may need a high input of care initially, with lots of education about the condition, and perhaps help with food shopping and meals to maintain their blood glucose levels. As their ability to cope grows the nurse can step back, with less frequent contact. Adult community head of nursing at the trust Cepta Hamm became interested in the Buurtzorg model after she took up her post a few years ago and found the district nursing service was struggling. The service had vacancy rates of up to 40%, and had become increasingly task focused, with nurses not given the opportunity or time to focus on their patients. District nursing teams around the country were facing a similar crisis. An initial review of the pilot by Kingston University and St George’s University of London found that it drew praise from patients, carers and nurses. The nursing teams, called neighbourhood nurses, help co-ordinate care, liaise with GPs and secondary care, and help arrange social care. Nursing staff were also positive about the experience, telling researchers how much they loved providing holistic care. One nurse commented that ‘every day is a pleasure’. But the researchers also said some nurses did not take up offered posts, and others had left their post during the pilot, suggesting the move to a self-managed team is not for everyone. Previous research has suggested that the Buurtzorg model can be cost-effective. A 2015 review by the Commonwealth Fund, a US-based health think tank, found that in the Netherlands it has ‘earned high patient and employee ratings and appears to provide high-quality home care at lower cost than other organisations’. The evaluation of the UK pilot did not consider the cost of the neighbourhood nursing team compared with standard community nursing, in part due to a lack of information on the acuity of patients. Analysis of patient records revealed that the new teams had low ratios of patients to nurses, and a more in-depth study is needed, the researchers said. Neighbourhood nurse Yasmin Kamara has worked in the Lambeth team since it was established in 2016. She had been working for a community nursing team and found her caseload of patients with complex needs could not be managed within the available time. ‘My worry was patient safety,’ she says. ‘But this model is rewarding, holistic and focuses on patient-centred care with a high level of engagement and health promotion. We look at the individual and their whole aspect, rather than just going in and out. The team mainly works from 8am to 8pm, but a nurse is also on call throughout the night to give support by phone. Jobs such as admin and drawing up a work roster are shared among the team, while some administrative support is provided by the trust. The nurses manage themselves at ‘solution-oriented’ meetings where proposals are only acted on if everyone supports them. The focus is on being positive and supporting each other. Issues that cannot be resolved between colleagues can be worked through with a coach. The trust, which says the model supports its desire to bring health and social care closer together, plans to continue the teams that are already running, and will look at whether it can be rolled out further. Ms Hamm says there are some aspects that need thought when it comes to trying to integrate this approach more widely into NHS community services. That includes working on an affordable financial model that can fit with the NHS, and a governance structure that can provide assurance on the care patients receive. Career progression and pay structure is another issue, as the flat management structure means there is little opportunity to progress. Ms Hamm also wonders how the novel approach of self-management can fit into the hierarchical NHS structure. But she believes it will take hold. ‘The biggest win is when I sit with neighbourhood nurses and they say this is the best job they have ever done,’ Ms Hamm says. ‘I have never heard community nurses say this before.